In this file photo, Tiffany Haddish attends the 2018 Vanity Fair Oscar Party on March 4, 2018 in Beverly Hills, California. Beyonce and Jay-Z throw some wild parties--sometimes unintentionally. Tiffany Haddish was invited to one of the couple's bashes in December 2017, where she managed to snag a selfie with Beyonce. Haddish later claimed that the singer agreed to take a picture with her as a means to prevent her from hitting a woman who had gotten too close to Jay-Z. Now, in GQ's April issue (on stands now), Haddish is sharing new details about the event. Beyonce approached Haddish and said, "I'm Beyonce," as if it were no big deal. There was also an actress who was "just, like, doing the most-est," Haddish says. "She bit Beyonce in the face." Haddish declines to name the actress, and Beyonce's rep says she "cannot comment" on the alleged incident, as she has "no knowledge" of it. Haddish continues, "Beyonce stormed away, went up to Jay-Z, and was like, 'Jay! Come here! This b----' and snatched him. They went to the back of the room. I was like, 'What just happened?' And Beyonce's friend walked up and was like, 'Can you believe this b---- just bit Beyonce?'" From there, "a lot of things happened." Haddish kept bumping into the unnamed actress throughout the night, culminating in a brief standoff. At one point, as the couple happened to be walking by, the actress told Haddish to stop dancing. So, Haddish tapped Beyonce and told her, "I'm going to beat somebody a-- at your party. I just want to let you know that." Beyonce asked her to calm down, telling her to "have fun" instead. To diffuse the situation, Beyonce took a selfie. "Near the end of the party, Beyonce's at the bar, so I said to Beyonce, 'Did she really bite you?' She was like, 'Yeah.' I was like, 'She gonna get her a-- beat tonight,'" Haddish said. "She was like, 'Tiffany, no. Don't do that. That b---- is on drugs. She not even drunk. The b---- is on drugs. She not like that all the time. Just chill.'" 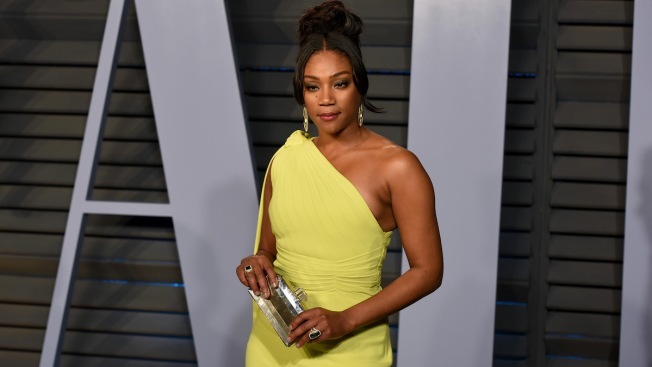 Original Post: Tiffany Haddish Claims a Drugged Out Actress "Bit Beyoncé in the Face"